Less than 3 minutes to 2 beaches, 5 minutes to restaurants, bars, shops and cafes in Oneroa and only 6 minutes to the ferry terminal. This unique home has served as a home and private holiday house for business executives and families, and is still close to the action. Set on a fully landscaped section which is all planted out with Rhodendrons, Tree Ferns, Palms, Cabbage Trees, Dragon Plants, Frangipani’s and Magnolias as well as mature Puriri trees which attract Tui’s and Rock Pigeons. There are no lawns to mow! This warm, north facing home has decks that wrap around the entire house. Chase the sun or escape it …… choice is yours. 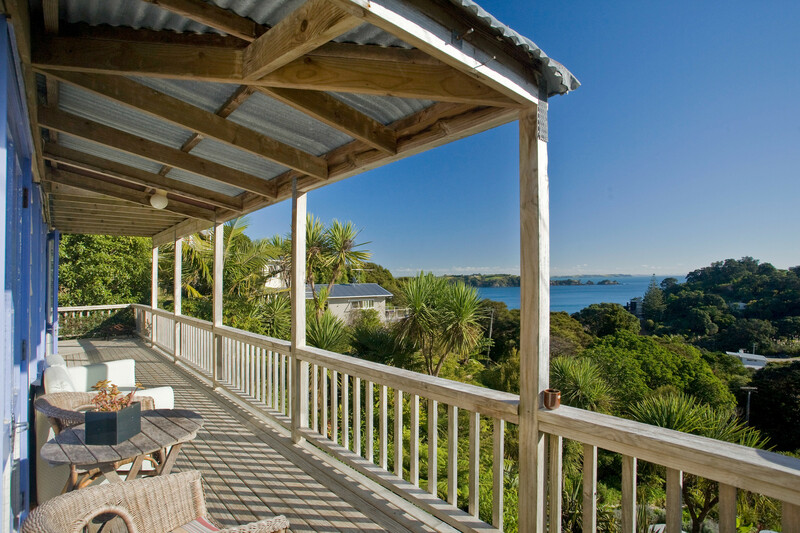 Sit on the decks – in your spa or recliner and gaze out at the turquoise sea of the Hauraki Gulf, watch the yachts sail into Oneroa Bay or just enjoy the peaceful surrounds of bush from the reserve. Protected from the prevailing SW winds you’ll feel like you’re living in a little piece of heaven. Work from home in the purpose built upstairs office – all set up with built in desk, ready to go internet connection – wireless or broadband. The office has no windows ……….. if it did, you’d never get any work done! A huge master bedroom upstairs has it’s own deck. 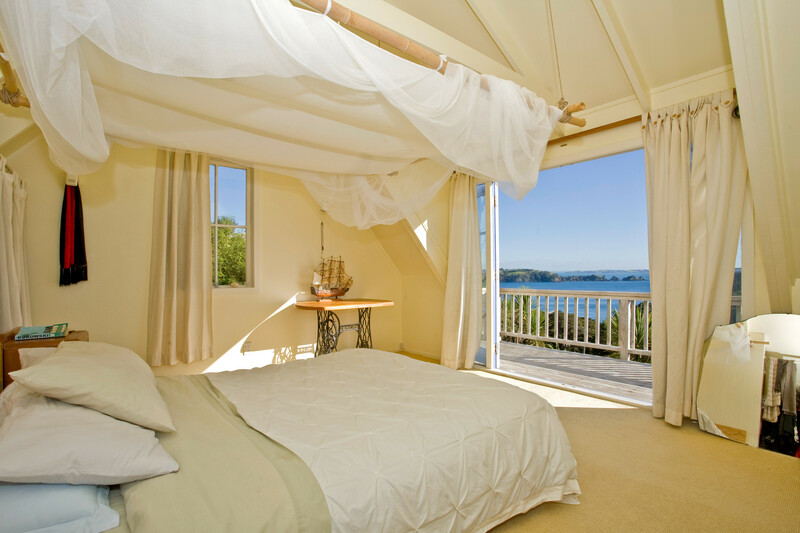 Lie in bed and look out over the Hauraki Gulf to Rakino and Great Barrier Island, sleep in, get up early or stay in bed all day long. The exterior of the house (weatherboards, joinery and roof) is being painted and will be completed in the second half of June. Add this to the landscaping that has been professionally done there is nothing to do outside. 2 further bedrooms, 1 upstairs and 1 downstairs with open plan lounge dining and french doors opening up onto the northern decks. An open fireplace makes this property warm and toasty in winter. If it’s a family home you’re after or a good holiday home then look no further than this gorgeous house located in Sandy Bay, Waiheke Island.